Did you know that there are huge potential health risks when working with a desktop computer, laptop or handheld device? A survey (conducted by ergonomic experts, Fellowes) of 1,250 people who work in an office found that 64% thought their working environment had a negative impact on their health, with a further 45% claiming their employer did not offer the equipment needed to make them feel comfortable at their desk. The HSE also reported that in 2017/18, 469,000 workers suffered from work-related musculoskeletal disorders. It's clear to see that hundreds of thousands of people across the UK are suffering long term back and neck pain due to increasingly sedentary jobs, so it's crucial that any employee that uses DSE is given the appropriate training, in fact, it's a legal requirement. 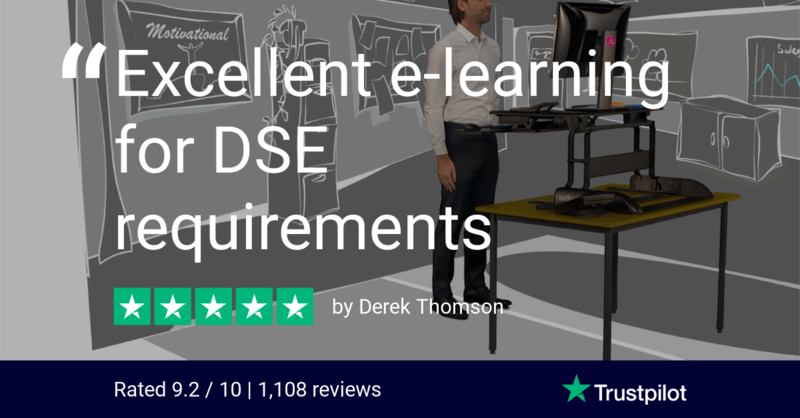 Effective DSE Training doesn't have to be expensive, time-consuming or boring! Just ask us for a free trial of our course below and you can see just how simple sorting your training out with iHASCO really is! You can check out all of our Trustpilot reviews here, where we score an ‘Excellent’ rating of 9.2/10! Why is DSE Training so important? All of the above can cause significant discomfort and have a huge impact on staff productivity, not to mention absences, and that's why it's so important to give your staff effective DSE Training. What makes our DSE Training the best around? Our DSE Training course is split into 4 easy-to-follow sections that look at your Posture, how to look after your eyes, 'DSE Stress' and how to correctly use portable devices. It also contains a free DSE Assessment that takes just 10 minutes to complete - If we spot a potential problem with your workstation we'll offer you some advice and there's also a comments box for you to make additional notes relating to your answer. Learners will also receive certificates upon completion of the course so you can show your commitment to The Health and Safety (Display Screen Equipment) Regulations 1992. Our DSE training is more than just a tick-box exercise, it engages the learner and provokes a positive behavioural change - it's IOSH Approved and can be completed in as little as 25 minutes; your staff will love it!